Lest there be any doubt that their party has moved drastically to the left, Democrats just elected a self-avowed socialist over the current Chair of the House Democratic Caucus. 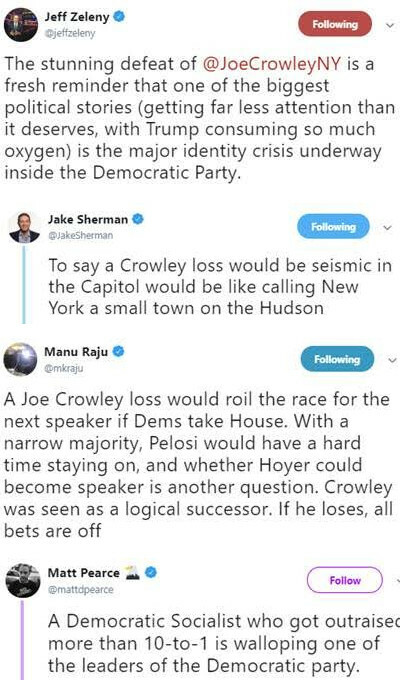 10-term incumbent Rep. Joe Crowley (D-N.Y.) was widely rumored as a possible successor to Democratic leader Nancy Pelosi. Crowley was a reliable vote for Pelosi’s far-left agenda, but Democrats instead chose a radical 28-year-old socialist who supports the abolition of ICE, government-guaranteed jobs, and single-payer health care. For those who quibble with the differences between Socialism vs. Communism, please consult with Vladimir Lenin. Let us all hail the new Communist Party of America.